Boutique Villas Petra 2 'Amanda' is the ideal choice for your holiday in Crete. 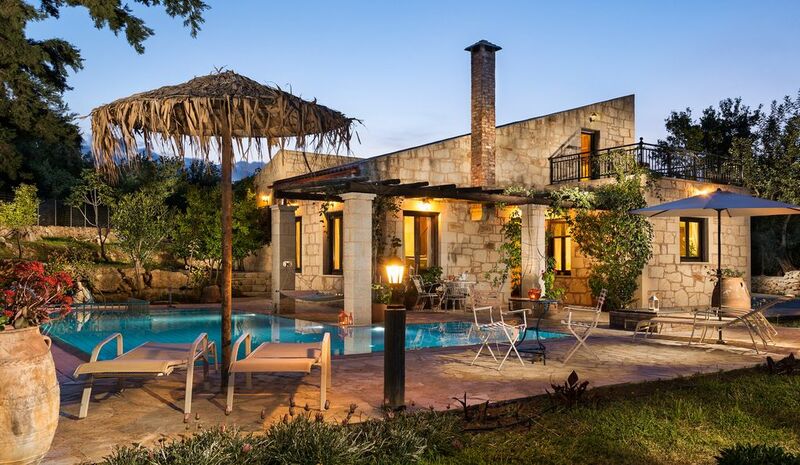 Villas Petra were built with traditional Cretan architecture and is furnished in an attractive momtern and relaxing style. your stay including a fully equipped kitchen, Jacuzzi tub, satellite TV. is just 5 kms from the lovely sandy beaches of Georgioupolis. The villa can accommodate comfortaple 8 people. Has 3 big bedrooms (2 with double bed and 1 with 2 singe). 3 bathrooms and 1 big private loft. We thoroughly enjoyed our stay in this beautiful, comfortable house. The description and photographs were very accurate. The property is well-maintained and clean, and the owner was very friendly and helpful. Our group included a handicapped elderly person and a small child, and we were very comfortable here. The house is on a mountainside off a dirt road, close to a tiny village with one taverna (excellent) and a tiny church with Byzantine frescoes. With a car, however, you are close to the major roads on the coast and it was very convenient for exploring the region. The grounds were beautiful, my daughter enjoyed the pool and the view was spectacular. We would definitely recommend this property to our friends. The only issue we had was that we arrived after dark and it was difficult to navigate unlit mountain roads in the dark. Thank you so much for making us so comfortable . This place is like a little piece of heaven, The stress simply dissolves with each passing day. Nothing is to much trouble for you all, such brilliant and thoughtful hosts. We rarely return to the rentals we have been in for vacations, but this lovely Villa is the EXCEPTION. As good old Arnie said Well be back ! The pool is a place of peace and lovely to swim in. Beds and pillows lovely and comfy the villa has every facility for a spendid break. To sum up we can recommend Villa Petra II ‘Amanda’ highly enough and we feel very fortunate to have discovered this part in Crete . My accommodation was excellent. The owner was very friendly and we had many facilities and many things to do in the garden and generally in Chania, The Villa was very close to perfect beaches and to small villages with greek traditional food. Villa Petra Greek island Crete Chania Rethymnon Georgioupoli beach Apokoronas Maza village villa beach mountain traditional pool nature fishing diving walking horse riding cycling mountain biking woods forest fully equipped air-conditioned hydro massage bath room garden trees tavern coffee villa. A 30% of the total value of the reservation is required in order to book the villa. If you cancel your reservation two months prior to your reservation date a full refund will be provided on your deposit. For cancellations within 2 months of your reservation there is no return of the deposit.